The following is an excerpt from The Joy of Argument. 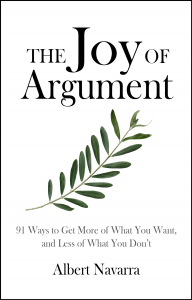 If this passage gets you thinking about how you can more effectively use argument in day-to-day life, check out the complete book in paperback or e-book format here. Relying on public opinion is not always the most reliable way to judge something. Sometimes you really can’t tell unless you try it, and judge for yourself. A recent poll showed that 62% of Americans think the government should cut spending to help the economy. So is that all we need to know? Just start cutting? Whether spending cuts (“austerity measures”) will help or hurt the economy depends on many factors, for example, the effects on the poor and middle class, government’s ability to pay its debt liabilities, investors’ trust in a government’s ability to pay its debts, effects on interest rates, and even psychological factors. It’s more complicated than a public opinion poll. And public opinion changes. Another recent poll showed that 87% of Americans favor marriage between blacks and whites. In 1958 it was 4%. Public opinion does have a certain allure. It can feel a little uncomfortable to hold a minority viewpoint. Politicians play on this emotion by arguing, “most people agree that…” or “most people don’t support…” But sometimes the minority is right! Just because a lot of people believe something, or are doing something, doesn’t prove it’s a good idea. Don’t jump on the bandwagon just because a lot of other people are.